Markets closed the week strong on Friday, with crude oil rising by almost a full dollar. Across the board, oil products hit new three-year highs. Today, crude prices have given up most of the gains. After opening above Friday’s closing price, markets have been steadily falling, giving up 91 cents (-1.4%) to trade at $65.23. 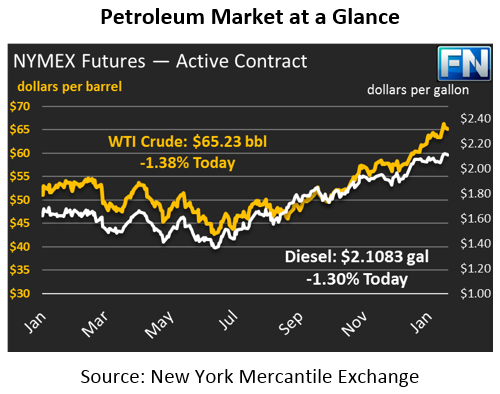 Refined fuels moved in conjunction with crude. Diesel prices rose 2.5 cents, while gasoline added nearly 3.4 cents. Both products are in the red today, though diesel is certainly the bigger loser of the day. Diesel prices are currently 2.8 cents (-1.3%) lower, trading at $2.1083. Gasoline, on the other hand, has only given up about half a cent (-0.3%), trading at $1.9318. The downward trending market appears to be driven by profit-taking, as little bullish news is giving markets a chance to catch up. Friday’s CFTC data showed a very minor decrease in net speculative length, but overall hedge funds remain heavily invested in oil markets. With prices peaking above $66 on Friday, markets appear to have more room to run before moving back to lower ground. Friday brought an updated rig count from Baker Hughes, and the result showed that U.S. producers are reacting to higher prices. Overall U.S. rigs rose by 12 last week, the strongest growth in 10 months. Rigs in the Permian basin, currently the most prolific shale region in the U.S., grew by 18, the biggest gain since 2013. With prices at multi-year highs, oil companies are finally committing to more production. Although market fundamentals have recently been subject to OPEC’s whims, the U.S. is quickly becoming a major force to be reckoned with.